Raccoons have distinctive black masks and ringed tails, making them easy to identify. They are basically nocturnal, though they do sometimes come out in the daytime to search for food. In winter, raccoons spend a lot of time in their dens but never truly hibernate. They are omnivores who consume many different kinds of foods, typically adjusting their diets to take into account what’s available locally, especially if they live near humans. Fruit is important for raccoons. They consume plenty of apples, blackberries and cherries when these are available. They rely on nuts such as acorns and beechnuts to get them through the cold winter months, and they eat many kinds of seeds and grains. In areas where humans have planted fields or gardens, raccoons typically add corn to their diets when they find it. Many times they come to depend on this important staple, stealing and eating corn whenever they can. 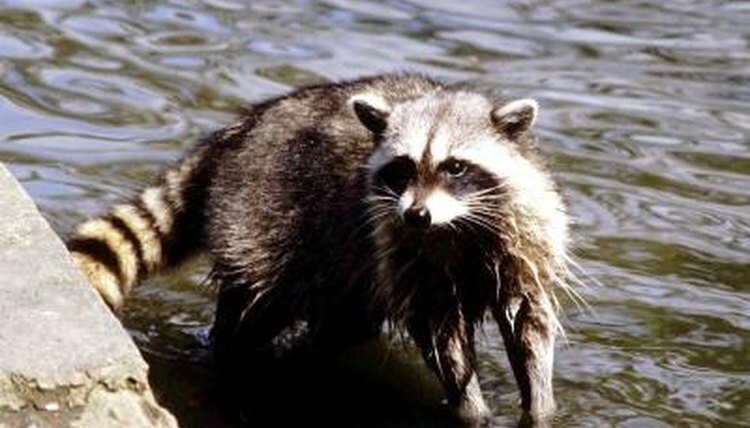 Raccoons consume aquatic animals such as frogs, turtles and crayfish. They also eat many different kinds of small mammals, including mice, bats, voles, muskrats and rabbits, and they’ll eat ducks and other birds if they can catch them. Other types of animals that make up the raccoon’s diet are snakes, fish and freshwater mussels. Typically raccoons focus on eating animals in the spring consume mostly vegetation in the summer and fall. Since raccoons are opportunistic feeders, they will eat almost anything they can find. Turtle eggs, duck eggs and any other eggs they can find offer a ready source of nutrients. Earthworms and insects are another important part of this animal’s diet, especially in the spring, before fruit, nuts and grains are available. Raccoons who live around people supplement their diets by visiting nearby homes on a regular basis, looking for their share of any dog and cat food that has been left out. Raccoons who live near humans scavenge for discarded human food, eating from garbage cans. They will break into tents or other campsite shelters if they can, and they’ll make their way into houses to steal. Dead animals represent easy meals for raccoons; carrion makes up an important part of their diets, sometimes leading them to the dangerous practice of scavenging along the side of the road.